The + operator adds two integers and concatenates two strings. 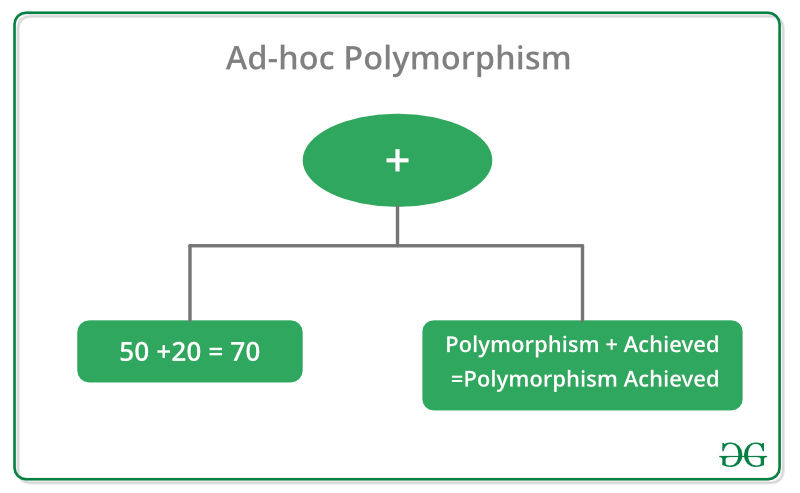 Hence, by calling two different functions(which differ in the type of arguments) having the same names, to execute multiple operations, we have successfully achieved Ad-hoc Polymorphism. 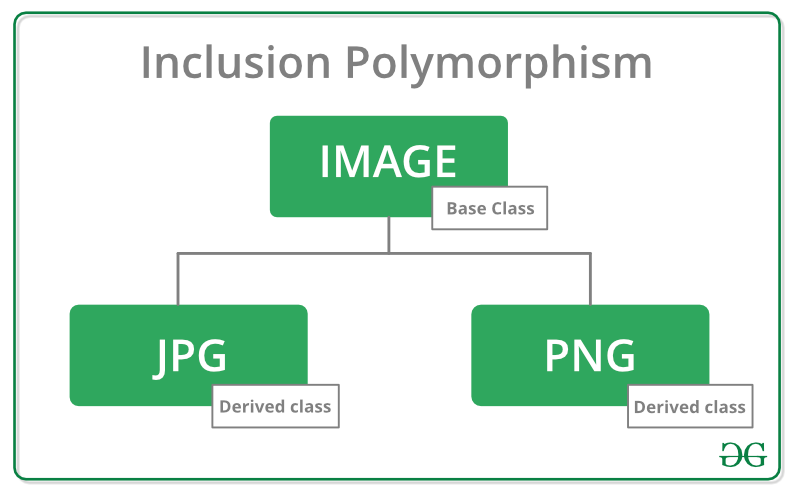 Inclusion Polymorphism is the ability to use derived classes through base class pointers and references. It is also known as Run-time polymorphism because the address of the function is not located by the Compiler at compile-time, rather, the right pointer from the virtual table is dereferenced to invoke the function at run-time. The concept of Virtual Function, also known as Dynamic Linkage, is employed to achieve Inclusion Polymorphism.The usage of Virtual Function allows the selection of that function which is to be invoked based on the kind of object for which it is called. To implement such a Polymorphism technique, let us take different files under consideration such as .jpg, .gif, .png files. All these files fall under the category of Image Files. Hence, in the above code, we have two different Classes with a function having the same name and not differing by Parameters, but with different implementations. 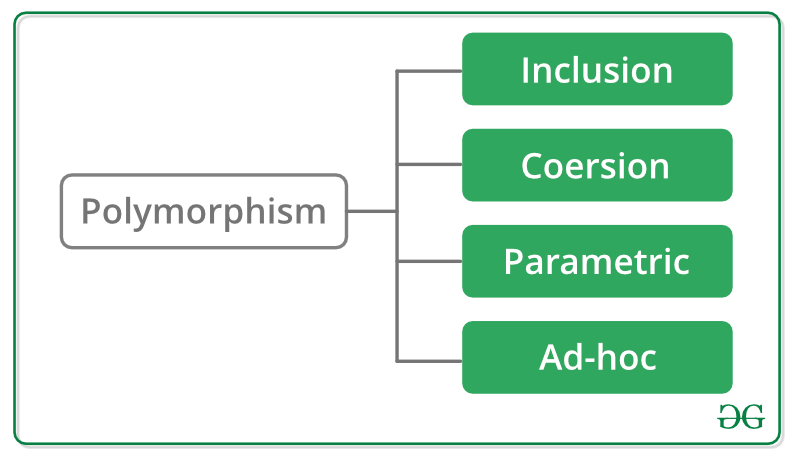 Coersion Polymorphism occurs when an object or primitive is cast into some other type. It could be either Implicit or Explicit. Implicit casting happens as a responsibility of Compiler itself. Explicit casting makes use of some type-casting expressions such as const_cast, dynamic_cast, etc. When a class defines conversion operator for some type, say “int”, then, it could be employed anywhere in the program where integer type data is expected. The IntClass reference is used in place of integer type argument, and hence, the concept of Casting is well understood. Parametric Polymorphism opens a way to use the same piece of code for different types. It is implemented by the use of Templates. Using Templates, the same function can be parameterized with different types of data, but this needs to be decided at compile-time itself, and hence, this polymorphism is named so. If we wish to achieve such polymorphism for pointers, it turns into Ad-hoc Polymorphism.